As workers have found themselves without jobs, Social Security has received fewer contributions. The 2007 Trustees' Report projected 169.0 million workers in 2011 earning $6.5 trillion in taxable earnings. Last year, there were only 157.7 million workers earning $5.5 trillion. In other words, there was a $1 trillion shortfall of income in 2011 alone compared to the pre-recession baseline. If this doesn't highlight the need for much greater action on the jobs front, nothing does. 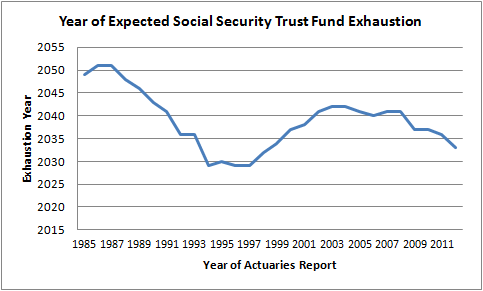 What we see from the Trustees Report is that as jobs and income decline, Social Security is directly harmed. And I'm starting to have the feeling that for the Republicans, this is a feature, not a bug. Not to be direct about it, but if the max contribution to the SocSecTF were still at the 90th percentile of earnings, instead of the 85th (or possibly below now), there wouldn't be that flat-to-declining trend from 2003 ff.